In actuality, Ryan is like a lot of politicians who merely cherry-pick Hayek to promote neoclassical policies, says Peter Boettke, an economist at George Mason University and editor of The Review of Austrian Economics. “What Hayek has become, to a lot of people, is an iconic figure representing something that he didn’t believe at all,” Boettke says. For example, despite his complete lack of faith in the ability of politicians to affect the economy, Hayek, who is frequently cited in attacks on entitlement programs, believed that the state should provide a base income to all poor citizens. To be truly Hayekian, Boettke says, Ryan would need to embrace one of his central ideas, known as the “generality norm.” This is Hayek’s belief that any government program that helps one group must be available to all. If applied, Boettke says, a Hayekian government would eliminate all corporate and agricultural subsidies and government housing programs, and it would get rid of Medicare and Medicaid or expand them to cover all citizens. (Hayek had no problem with a national health care program.) Hayek also believed that the government should not have a monopoly on any service it provides; instead, private companies should compete by offering an alternative Postal Service, road system, even, perhaps, a private fire department. I’m glad Pete picked up on this. In my view, Hayek’s generality norm is the polar opposite of the Pathology of Privilege. And as I have argued in the past, the abolition of favoritism in government policy has both economic and moral appeal. This appeal, moreover, seems likely to cut across the ideological divide. This entry was posted in Government-Granted Privilege and tagged Austrian Economics, economy, George Mason University, GMU, health care, Paul Ryan, Peter Boettke, Postal Service on September 5, 2012 by Matt Mitchell. And so my answer is yes, I want more government involved in economic regulation and environmental cleanup and for reasons of public safety. I want less government telling me what personal choices to make as an individual. This answer, I believe, highlights the inadequacy of one-dimensional political thinking. Try as we might, it is pretty difficult to describe many peoples’ political beliefs without making them seem inconsistent. That’s why I think it is much more helpful to think in terms of (at least!) two dimensions. Consider the animation below. freedom as shown on the horizontal axis and b) more or less personal freedom as shown along the vertical axis. You can think of “libertarians” as favoring freedom in both spheres and “statists” as favoring intervention in both spheres. And you can think of “left” and “right” as favoring freedom in one sphere but not the other and vice versa. Of course, you can take it one step further and think of a third dimension coming straight out of your computer screen. It would show more or less intervention in foreign matters. (Sadly, my animation skills are not yet advanced enough to render such an image). I understand why U.S. political parties feel the need to conform to the tired, old one-dimensional view of politics. Long ago, the political scientist Maurice Duverger asserted that two and only two political parties are likely to be viable in democracies that employ the type of voting rules the U.S. employs (one member represents each district and that candidate with the most votes is declared the winner). With such voting rules, third parties rarely win and so their financial and political support tends to dry up over time. Conversely, in countries where, say, the top three vote-getters each get a seat in parliament, third parties are much more viable. Given the fact that the U.S. is likely to have only two parties, these two parties must, by default, simplify matters and pretend that politics can adequately be described with a simple dimension. It is unfortunate, however, that the media and pollsters play along. ABC, for example, could have easily invited guests to defend the libertarian and the statist position. And pollsters could easily make room for two questions. Instead of asking people if they are liberal, conservative, or moderate (how is a libertarian to answer? ), they could ask people separate questions about their positions on social issues and economic issues. Most observers of politics outside of the United States identify at least two salient dimensions to the political party space. He cites research by Budge, Robertson, and Hearl (1987), Budge (1994), Laver and Schofield (1990), Schofield (1993, 1995), and Schofield, Martin, Quinn, and Whitford (1998). Here is a fun, short quiz to help you think through your own position in multi-dimensional issue space. This entry was posted in Public Choice and tagged ABC, Barney Frank, Dennis Mueller, economy, make, Maurice Duverger, Paul Ryan, research, United States, vote on December 22, 2011 by Matt Mitchell. The New Deal deficit spending helped boost the economy and bring the unemployment rate down to single-digit levels, but fear of deficits limited the scale of New Deal programs and caused Roosevelt to reverse course and cut back on spending in 1937, just as the economy was gaining momentum. So writes Dean Baker in the New Republic. This is marginally better than the myth I learned in high school: FDR saved capitalism from itself by embracing the wisdom of Keynesian economics. He “primed the pump” with massive deficit spending and lifted the economy out of the Great Depression. My high school story was a tad inconvenient for those who are fans of both Keynes and FDR: In 1940—7 years after the New Deal had begun—the unemployment rate still hovered at an astounding 14.6 percent. But the high school myth turned out to be wrong: Keynesian economics didn’t end the Great Depression because Keynesian economics was never tried. Keynes, remember, called for deficit-financed spending during downturns (and surpluses during times of plenty to pay off the debt). The data show that FDR (and Congress) implemented half of the Keynesian stratagem: real spending dramatically increased throughout the Great Depression. The problem—from a Keynesian perspective—is that they also massively increased (already-high) taxes so that, even as the economy collapsed, revenue soared. The primary failure of fiscal policy to be expansive in this period is attributable to the sharp increases in tax structures enacted at all levels of government. Total government purchases of goods and services expanded virtually every year, with federal expansion especially marked in 1933 and 1934. [But] the federal Revenue Act of 1932 virtually doubled full employment tax yields. But notice, Brown doesn’t say that FDR failed to be Keynesian because he stopped spending; he failed to be Keynesian because he also raised taxes. But that doesn’t stop many in the punditry from claiming that, in his later years, FDR was converted into some sort of proto-Paul Ryan. See this excellent post by Alex Tabarrok on the subject. See, also, these posts by Tyler Cowen. This entry was posted in Economic Policy and tagged Alex Tabarrok, American Economic Review, boost, economy, FDR, fiscal policy, Great Depression, New Deal, Paul Ryan, Revenue Act, spending, tax, Tyler Cowen on June 6, 2011 by Matt Mitchell. Budget Committee Chairman Paul Ryan’s spending plan has been released. Both sides are going to characterize it as a $6.2 trillion dollar cut in federal spending. Of course, in Washington a “cut” is rarely a cut. Usually, when politicians speak of cuts, they mean cuts in reference to what some other politician wants to spend. In this case, the chairman actually wants 2021 spending to be about $1 trillion greater than 2011 spending. But since the President wants 2021 spending to be nearly $2 trillion greater and since the annual differences between the two plans add up to about $6.2 trillion over ten years, Ryan’s plan will be called a cut. But what about inflation? And what about population growth? Since inflation erodes the value of dollars over time and since population growth spreads those dollars over an ever-expanding group of people, some will argue that we must increase spending just to maintain the same level of government services. I would note that in the non-political world, we expect technological improvements and efficiency gains to make things cheaper over time (witness computing power, smart phones, and plasma TVs–all of which have gotten cheaper in real terms over time). But let us make the reasonable assumption that government is incapable of efficiency gains. In this case, we should examine “real, per capita spending.” That is, after controlling for inflation and population growth, how much more or less will the federal government be spending per man, woman, and child? 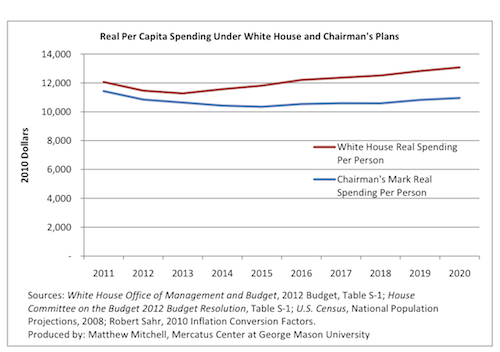 The chart below shows real per capita spending under the President’s plan (red) and under the Congressman’s plan (blue). By 2020 (I don’t have inflation projections out to 2021), the president wants to spend $1,012 more per person in real terms. In contrast, the Chairman wants to spend $470 less per person. To put this another way, the President would increase real per capita spending by about 8% while the Chairman would decrease it by about 4%. Just about everyone agrees that fiscal calamity awaits inaction. And numerous studies suggest that spending cuts are far more effective at addressing fiscal problems than revenue increases. In this context, is a 4% cut in spending really–as Ezra Klein characterizes it–“completely, almost gleefully, unacceptable“? This entry was posted in State Policy, Tax and Budget and tagged Ezra Klein, government services, growth, make, Paul Ryan, spending, White House on April 5, 2011 by Matt Mitchell.